Who’s Viewed Your Profile is one of the most popular destinations on LinkedIn – after all, we all secretly love to see who’s been checking us out. For many savvy professionals, Who’s Viewed Your Profile is more than just a glimpse of who looked at your profile, it’s a rich treasure chest filled with customized insights designed to help you build your professional brand, generate new opportunities, and manage your network. Today we’re introducing a new feature as part of Who’s Viewed Your Profile to help you see where you stack up relative to those in your network. With the new “How You Rank” tool, you can now see where you stack up to others in your network with profile views (this feature is coming to mobile). Take a look at the top profiles in your network to gain inspiration for changes you can make to your own profile, or content you can share to increase views to your profile and drive opportunities for advancement. Or, take a look at the suggestions LinkedIn offers on the right-hand side of the page for ways you can begin increasing views to your profile immediately. You can click here to see your rank and get personalized recommendations on how to lift your visibility. For job seekers: Recruiters at some companies receive hundreds of applicants for a single position. If you’ve submitted a resume or LinkedIn Profile already, try taking a look at the profile of the recruiter managing the position. If they see you’ve looked at their profile, they’re more likely to look at yours. Nearly 80% of candidates today are found through networking – so if you notice a recruiter at a company you’re interested in has viewed your profile, don’t be afraid to reach out to them. 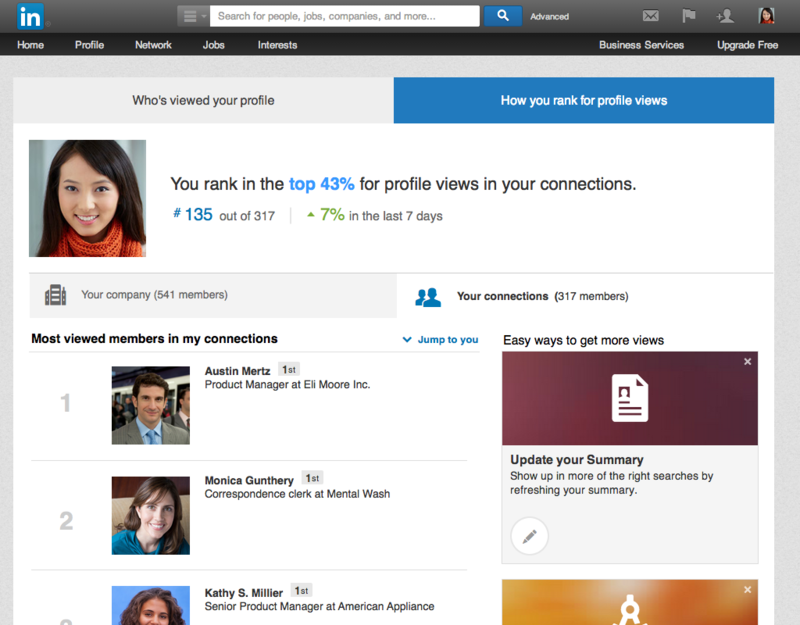 For consultants and business owners: Professionals come to your LinkedIn profile from all over the web, but rich data insights such as the keywords that led people to your profile, can help you determine how to effectively position yourself to attract new business and make valuable new connections. You can now also use the “How You Rank” tab to better understand who in your network can help increase visibility for your business. For students and new graduates: Students in search of their first job or trying to thoughtfully build their network can use Who’s Viewed Your Profile to attract the attention of recruiters or connect with potential mentors. Find alumni that have graduated from your school, view their profile or reach out and say hello. If you notice someone viewed your profile from an industry you’re interested in joining, don’t be afraid to reach out, introduce yourself and see what words of wisdom they may have for someone just starting out. Learn the best practices for crafting a rich Profile by browsing the most-viewed Members in your network in the “How You Rank” tab. For sales professionals: Curiosity leads many of us to view the profiles of those professionals that have viewed us. Sales professionals that use that knowledge to their advantage treat Who’s Viewed Your Profile as a way to generate warm leads. If someone has viewed your profile, and you share commonalities – it’s a great icebreaker for a potential new business opportunity. We know that no two professionals are alike and by seeing how you rank relative to your professional peers, we believe you’ll have the added information and incentive to help you put your best foot forward on LinkedIn.